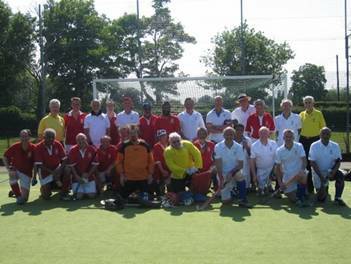 On a hot and sunny afternoon an LX side took on what was predominantly the Eastcote Over-50s league team. The LX side came under pressure from the start, with the skilful Eastcote forwards forcing several penalty corners. Alan Dures in goal made several good saves to keep the score at nil-all for the first quarter of the game. However, it was from another penalty corner that Chris MacLallan deflected the strike at the near post to give the home side a half-time lead. The LX half-back line of Brian Stokes, Brian Perryman and Richard Clarke matched the opposition in control of the midfield, being ably supported by inside-forwards John Grinham and Parmjit Bolina. However, our forwards were not able to get the better of the Eastcote defence. Early in the second half, with LX legs beginning to tire under pressure, a missed pass in the midfield allowed Eastcote to outnumber our defence and score a well-worked goal, with Paul Bloomfield tapping in at the far post. The game was played in an excellent spirit. Chris Clarke and Ian Fitzgerald made a particular point of saying that it had been a pleasure to umpire the game. After the game we were treated to the delightful Eastcote hospitality, which included a selection of superb curries and puddings. LX Team (in white): Alan Dures (Goal), Brian Tubb, Sudesh Nayar, Richard Clarke, Brian Perryman (Captain), Brian Stokes, Peter Curtis, Parmjit Bolina, Rod Cochrane, John Grinham, Peter Ross, Graham Martin. The Eastcote team featured LX members Lloyd Wood, Eric Best, Dominic Bann and Sarosh Talati.